I am on Row 387 of 425. I took a long hiatus during July and until this week in this project. Something to do with Tour de Fleece and having another cardiac cath done made me lose the mojo temporarily. As I worked through the clues, I fell in love with this stole. Even DS #3 likes the stole and the yarn. I offered to knit him one, but he thinks shawls are too "girly" for him to wear. I guess I'll have to knit some Anne Hanson man lace for him instead. 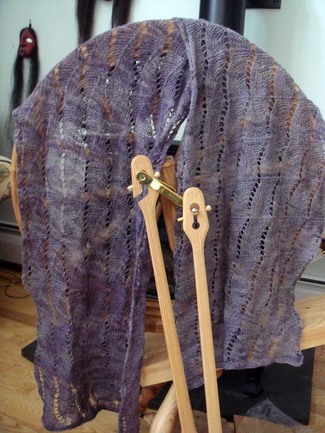 Anna has been doing an element series of lace shawls also. She's done Mystic Light and Mystic Waters (before I stumbled onto her patterns), and in September, she is doing the mass test knitting of Mystic Earth. 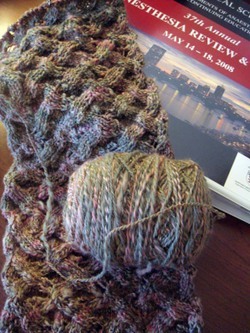 I've signed up for that KAL too, and am now scouting out "earth" yarn. I don't want anything flat & boring. I want something with depth of color.... up for suggestions. 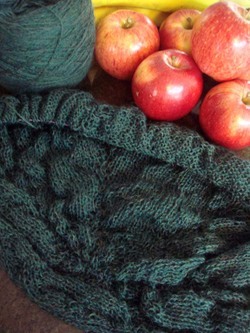 Anne Hanson's That Little Scarf was one of the projects I took along to Ireland with me. Needless to say, I didn't get much work done on it, although I guess it was about half way done when we returned. In the interim, I knit the Sock Knitters Pentathlon socks, and a Forest Canopy Shawl, but this week have returned to That Little Scarf. It is keeping me company in a conference I am attending - I sit in the back and listen and knit. It should be done either tonight or tomorrow. I've ditched the stitch markers I usually rely on while knitting lace, and things are going much faster - the stitch count shifts radically from row to row a few times, so moving markers was a pain. Much better now. 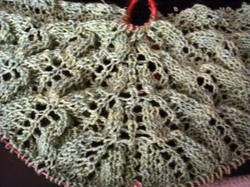 I fell in love with this design while Anne Hanson (Knitspot) was still swatching it. Simple upswept motifs of stockinette against a reverse stockinette neighboring patch of stiches. Easy. Understated. Somehow moving. And the yarn! The yarn is incredible and blooms to be even more so after a bath - cormo/angora from Wooly Wonka Fibers in "Dusk" - a lovely muted purple. I made the petite, which blocked to 25" X 84", but probably shrunk back a bit after unpinning. It is sufficiently lightweight to be able to be used as a scarf or a stole. I'm loving it enough to take it with me to Ireland, and the Dusk colorway blends nicely with my traveling Eggplant colored rainjacket.